Restrictions on protests outside the Houses of Parliament will be reviewed, Justice Secretary Jack Straw has said. Mr Straw told MPs they would see if "there is a better way both to uphold the right to protest and manage individual protests appropriately". 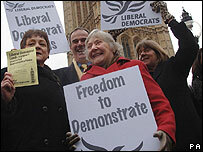 In 2005 a new law meant any protest within a 1km "exclusion zone" of the Commons required police permission. Within days of becoming PM Gordon Brown said the law, which has itself prompted many protests, needed changing. The government has launched a consultation, asking "whether different arrangements should continue to apply to an area around Parliament". It adds: "Allowing the business of Parliament to proceed unhindered needs to be properly balanced against the argument that Parliament's status as the forum of our democracy means that it ism and should be, a focus for demonstrations. "Elected representatives need to be able to hear the concerns of the electorate and should not be sheltered from the voice of protest groups." But the document - Managing Protest Around Parliament - also says the "security risk" has to be looked at. It asks whether the current arrangements are "the most appropriate for circumstances in 2007". One suggestion given is to ask demonstrators to give "prior notification". The document says this could apply only to groups "over a certain size". The consultation is due to end on 17 January next year.